All Scottish rail services are expected to run as normal after a second 24-hour strike due to start at noon on Thursday was called off. The walkout was suspended after a nine-hour meeting between Network Rail, the conciliation body Acas, and the Rail Maritime and Transport union (RMT). The RMT said progress had been made and it would consider a full report before making a statement later in the week. Network Rail said it now hoped a normal timetable would be running. A total of 450 signal workers were due to take part in the strike action. A 24-hour walkout on Tuesday severely disrupted rail services and caused traffic chaos throughout Scotland. The row centres on rota changes and compulsory safety assessments. 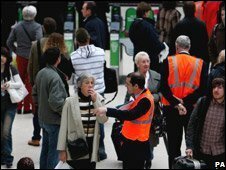 The RMT insists employers have failed to move on its demand to stop last-minute changes to rotas. Network Rail said it had made concessions on that issue but safety assessments remained the sticking point. Both sides met at the Acas offices in Glasgow at 1400 BST and ended the meeting just before 2300 BST. A spokesman for Network Rail said: "This dispute is all about our ability to continue to provide a safe railway. "We are pleased that strike action has been suspended and will continue to seek a negotiated resolution to this dispute. "We will now work to restore train services to the travelling public as quickly as we can for tomorrow." Mary Grant, managing director of train operator First ScotRail, welcomed the suspension. She said: "I thank our customers for their patience and understanding over a dispute which was outwith our control. "It is hoped issues have been resolved so that they are not let down in this way again." 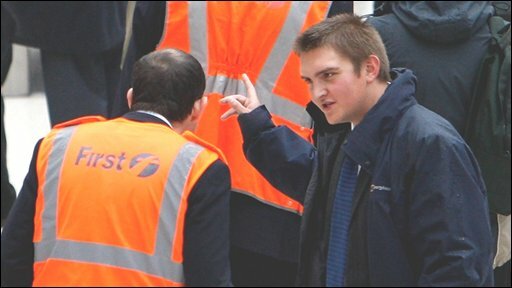 Talks begin between Network Rail and the RMT union about an on-going dispute. The company said it would try to run as normal a service as possible on Thursday, but that there could still be minor disruption. Last-minute negotiations had broken down on Monday after no agreement was reached. First Minister Alex Salmond said the move would come as a great relief to the travelling public. He said: "The suspension of the planned action, under the auspices of Acas conciliation, is a significant step forward, and I hope that unions and management can now settle their remaining differences." The first strike began on Tuesday at noon and affected rail journeys across the country. First ScotRail said it tried to run as many services as possible during the walkout. A limited timetable operated between Glasgow and Edinburgh and in the central belt on Wednesday morning. However, no trains ran north of Perth during the stoppages because the larger number of smaller signal boxes makes the area harder to cover using contingency staff. Replacement bus services were running between Aberdeen and Inverness. Virgin Trains cancelled two cross-border early morning trains. Some services from England to Scotland were also cancelled or diverted.